Commissioner Stacy White filed a lawsuit in December against numerous defendants related to All for Transportation's $16 Billion transit tax hike charter amendment challenging the language used in the charter amendment. It is case #18-CA-011749. AFT, some county commissioners and others who supported the tax hike have called the lawsuit ridiculous, a political stunt and "nonsense". But their rhetoric may be the "nonsense". Time to step back and break things down, especially statutorily. Local media continues to selectively filter reporting about the tax hike, White's lawsuit or why it was filed. A Charter is a document that spells out the powers, duties and structures of government and the rights of citizens. It is often compared to constitutions at the local level. The way public officials are elected, the form of government, and the role citizens play in local government. A local government has all powers of self-government except those that are specifically prohibited or pre-empted by the State. Charters are local governance documents not legislative or appropriations documents. Florida statute 125 Part IV grants counties the power to be structured as a home rule charter county. FS 125.86 enumerates the legislative responsibilities vested in county commissioners. Remember AFT's transit tax hike is a charter amendment. The state enables all local sales surtaxes. State statutes governs the local transportation sales surtax included in AFT's charter amendment. The surtax, if levied, shall be computed as the applicable rate or rates authorized pursuant to s. 212.055 times the amount of taxable sales and taxable purchases representing such transactions. FS 212.055 governs what local sales surtaxes counties are authorized to impose and their rates. State statute language clearly addresses local sales tax in percentage rates because that is how tax rates are defined. Yet AFT's ballot language stated it was an amendment to the county charter to enact a one-cent sales surtax levied for 30 years. Why would AFT do that? This is the language AFT used to gather petition signatures. Semantics matter for any legal framework as well as being honest and truthful. A one-cent sales surtax does not exist in Florida statute and does not equate to a one-percent surtax. One-cent does sound less ominous than one-percent. But is AFT's language deceptive? All the other proposed local transportation sales tax hike referendums were expressed as a percentage rate. Lawyers know this and it is reasonable to assume that any lawyers vetting AFT's tax hike referendum would have informed AFT. Ironically, after AFT's charter amendment claims to be enacting a one-cent sales surtax, of which no such sales surtax exists, AFT reverted to using percentage rates for how and where to appropriate the tax proceeds. State statute 212.055 (sighted above) addresses who has the authority to appropriate the local sales surtax proceeds. Duly elected county commissioners have appropriations authority. They are authorized to apply the tax proceeds to any of the uses enumerated in statute 212l.055 as the duly elected county commission "deems appropriate". It would be reasonable to assume lawyers vetting AFT's tax hike referendum know state law and would have informed AFT accordingly. Appropriations In law and government, appropriation (from Latin appropriare, "to make one's own", later "to set aside") is the act of setting apart something for its application to a particular usage, to the exclusion of all other uses. It typically refers to the legislative designation of money for particular uses, in the context of a budget or spending bill. The legal issues appear to be much bigger and broader than just the legality of the Oversight Committee that some local media narrowly focuses their reporting about. AFT did not only create charter amendment language for a transit tax hike, they included 5 pages of of regulations and spending mandates for 30 years. AFT "earmarked" spending appropriations for how $16 Billion of tax proceeds must be spent for 30 years based on how "they" wanted the tax proceeds spent. As AFT spokesperson Christina Barker admitted in October "Our story is one of a few people who got together. We were writing a charter amendment over drinks." AFT's charter amendment specifically mandates how and where the tax proceeds must be spent. AFT intentionally removed appropriations authority from the county commissioners, not only for the current commission, but from future county commission boards for 30 years. 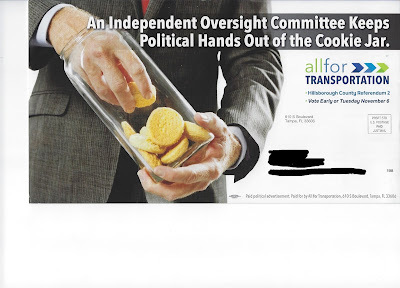 It appears AFT knew what they were doing because they were so gleeful about taking appropriations authority away from elected officials, they used it in their advertising. However, even if the current commission agreed to appropriate the tax proceeds how AFT mandates, a future commission may not want to. Many things can occur over 30 long years, including technology breakthroughs, innovative disruptions, economic downturns or turmoil or changes to regulations, etc. It is reasonable to assume that duly elected officials can react to such change(s) by making a change(s), especially to spending, because they are accountable. But if duly elected county commissioners cannot react accordingly and when needed, the county and taxpayers are put at risk. Who is held accountable for failure or fiscal distress when the only recourse to make changes is another charter amendment? What risk assessments, if any, were done by AFT? State statute 212.055 also states any sales tax proceeds remitted to a transit agency such as HART is to be used at the "discretion of such authority". Discretion is defined as "the power or right to decide or act". To our knowledge, the HART Board had zero input to AFT's mandated transit spending appropriations. HART never voted or made any decision for how the estimated $7-8 Billion they will receive from the tax hike must be appropriated. HART has no plan. AFT's mandated transit appropriations usurps the appropriations authority duly given to the governing board of HART by state statute. The mandated appropriations impacts not only current HART Board decision making but future HART Boards for 30 years. It is reasonable to assume that any lawyer vetting the referendum language would inform AFT accordingly. If HART funds costly transit projects that are outdated, have cost overruns, have lengthy delays, become fiscal disasters, have low ridership, and high operating costs - taxpayers are stuck. AFT intentionally provided no way for HART's own governing Board to mitigate financial distress. That is risky business. AFT's unelected Oversight Committee, another layer of transportation bureaucracy, is accountable to no one. AFT gave them limited ability to reallocate some of the road purposed appropriations mandated for safety improvements and intersection improvements but not bike paths and sidewalks which are vastly overfunded in the tax. AFT redefined what road improvements are to exclude new road capacity to intentionally not appropriate any specific funding for new roads. Instead AFT specifically put prohibitions on the ability to appropriate funds from $16 Billion of tax proceeds for new roads for 30 years. The only reference to funding new automobile lane capacity in the AFT charter amendment is to prohibit such funding. Red flags about potential legal issues were raised prior to the election. As we reported here, in a written response to questions from Times reporter Chris O'Donnell on October 18th, NoTaxForTracks brought up potential legal issues related to the tax hike. Revisit here Commissioner White's public statement he made on October 18th. Tampa Bay Guardian posted an article about these issues on July 7th during the petition process. Local media, including the Times who was specifically told there may be legal issues, totally ignored the issue. They were MIA and uninterested. They intentionally refused to report and inform the voting public to beware that the charter amendment language may violate state law. AFT and county commissioner Kimberly Overman publicly claimed the charter amendment was closely vetted. According to this FloridaPolitics.com article after Commissioner White filed his lawsuit, All for Transportation said they had their charter amendment legally vetted by Holland & Knight. But the Tampa Bay Guardian could find no legal fees paid to Holland & Knight for legal services provided AFT. Although AFT claims to have had the law firm Holland & Knight “vet this,” AFT’s own campaign finance reports show no payments made to Holland & Knight. The only expenses identified by AFT as “legal services” are three payments totaling $1,639 to the firm of Meyer, Brooks, Demma & Blohm in Tallahassee. That law firm does not list “municipal law” as one of its practice areas on its website. If Holland & Knight provided their legal vetting services pro bono to All for Transportation, AFT would have to claim those services as an in-kind donation in their campaign filing. No such entry exists. Perhaps AFT's directly connected nonprofit, Keep Hillsborough Moving, Inc., paid Holland & Knight for their legal vetting services. Donations and expenditures to Keep Hillsborough Moving is dark money. There is no transparency or sunshine regarding funds associated with the nonprofit. However, Holland & Knight did donate $25K to AFT on 9/20/2018 according to AFT's campaign filing on the Supervisor of Elections website. Who is Holland & Knight? They are a law firm and lobbyists. Their office in Tampa was closely associated with the 2010 rail tax PAC Moving Hillsborough Forward (MHF). Holland & Knight donated almost $30K to MHF. They also received $105K from MHF for campaign services and consulting. They were being paid to run MHF's 2010 rail tax hike campaign. Tax hike lobbyists vetting a tax hike they support and donated to. The serious legal questions raised in White's lawsuit are bigger than just Hillsborough County. And there could be other legal issues that arise thru the Discovery process. If wealthy special interests can dump millions into campaigns to put citizen initiated tax hike referendums on the ballot that appropriates funds to benefit them or their cronies, it will be a special interests field day in Florida - on the backs of taxpayers. AFT has provided no evidence to date of any legal vetting they say was done of their tax hike charter amendment. But now the legal vetting will be done in the courts. More great info about the ways in which this charter resolution is not legal! This must be reversed by the courts!